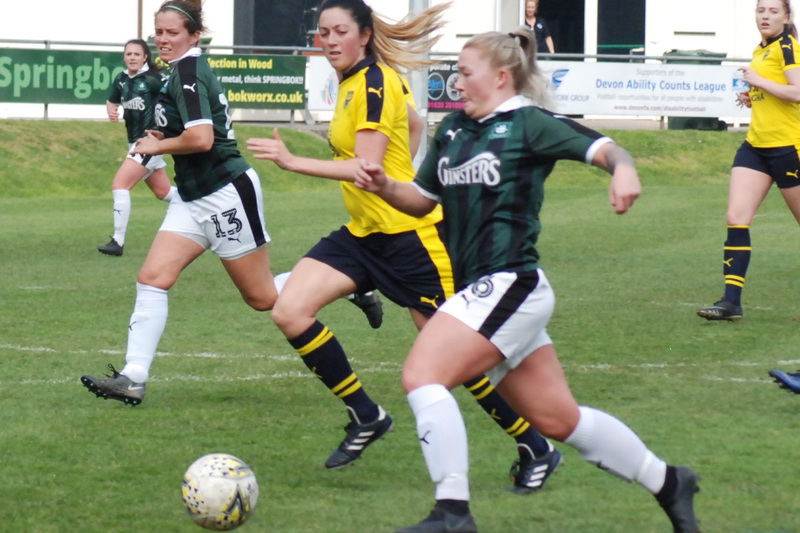 PLYMOUTH Argyle Ladies ground out a 1-0 victory over a spirited Oxford United side on Sunday at Coach Road. The in-form visitors had to play more than half the National Southern Premier Division match with 10 players after their captain Lauren Haynes sent off in the 33rd minute for a tackle on Argyle’s Jessica Jones. Both sides went into the game on the back of some good form. Oxford, who started the day in fourth, were on a six-match winning run, while seven-placed Argyle had lost just one of their last six games. Unfortunately the difficult playing surface made it hard for both teams to get their passing game going. “It wasn’t the best of games but we deserved our luck as we dug in and stayed solid,” said Argyle joint manager Dave Leonard afterwards. “We were up against a team who were in Super League Two last season and they had a player in Emily Allen who was outstanding. “We haven’t had the best of luck lately but we deserved that one piece against one of the best sides we have played. Argyle had Natasha Knapman leading the line for the first time since her injury in September and teenager Faye Ivall retained her place at left-back as Darcey Hepworth is still out injured. The Pilgrims started on the front foot and Zoe Cunningham wriggled her way along the goal line but her cross was weak, while Cunningham had a shot from distance well saved. Mollie Taylor then set up Becky Dandridge to find Knapman, but the goalkeeper came out to smother the ball. Cunningham then had a couple more efforts, while Dandridge and Jones also had good opportunities but could not find the target. Oxford eventually came into the game and the referee missed a handball. Argyle goalkeeper Sarah Prior was then called into action before Ivall had to make a decisive challenge. Both teams were having chances and a goal had to come, which it did in the 31st minute. From a corner Dandridge, Argyle captain Katie Middleton flicked the ball up to Kayley Lane, who got in a looping header that the back-tracking Oxford goalkeeper could not prevent crossing the line. Two minutes later Oxford had Lauren Haynes sent off for a crunching tackle on Jones. This incensed the visiting management team and the referee ordered their manager off. Argyle went looking for the second goal with both Dandridge and Jones shooting over. The Pilgrims pushed early in the second half with Knapman being denied by the Oxford goalkeeper after being set up by Pollock. Oxford, despite only having 10 players, began to take the game to Argyle with Allen outstanding. Argyle did nearly put the game out of reach when an inch-perfect Jones free-kick was headed on to the top of the crossbar by Lane. Middleton then had a shot from a Jones corner saved before the hosts survived some late pressure for Oxford.